A Ten Dollar Gift Card Redeemable For Any Stuff We Sell. Redeem your StuffPoints, or purchase this card to give as a gift. 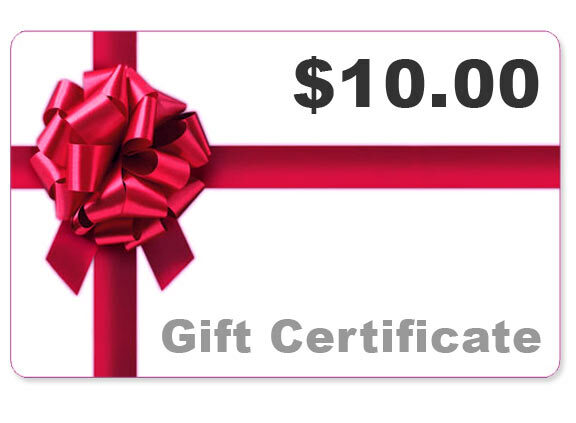 This gift certificate can be redeemed online or over the phone, and can be used on anything we sell. Upon placing your order, a unique code will be emailed to you. When placing an order, you can use this code to deduct ten dollars from your total order amount. When you purchase a gift card, it will never expire, and the amount will only reduce as you use it. To send a card to someone else, fill out the information above prior to adding the gift card to your cart. It will be emailed to the address entered upon checkout, and any note you add will be included as well. If sending to yourself, you can leave the boxes blank, and it will be emailed to the address you use when checking out. Order Yours Today! No specs. It's a gift card. A Five Dollar Gift Card Redeemable For Any Stuff We Sell. A Twenty Five Dollar Gift Card Redeemable For Any Stuff We Sell. A One Hundred Dollar Gift Card Redeemable For Any Stuff We Sell.